Do ghosts exist? Where's the proof? Well surely it would provide a solid case for the existence of ghosts if we were able to use cameras to photograph them? Many such claims have been made since the dawn of photography itself. Primitive technology and equipment to take photographs began to emerge in the early 1800's and developed quickly throughout the decades ahead. Right from the early days of photography came the claim that ghosts could be captured using cameras, which began with a man named William H. Mumler (1832-1884). William Mumler lived in Boston and originally worked as a jewel engraver. He practiced amateur photography in his spare time and one day in the early 1860's, he took a self-portrait photograph. 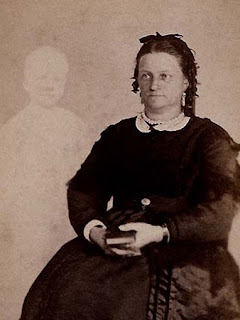 When this photograph was developed, he was suprised to see that he was not alone in his photograph- as he saw behind him a ghostly figure who he recognised to be his cousin, who had died 12 years prior to this photograph being taken. This is widely credited as being the first spirit photograph. As news spread of this story, people would then begin to ask Mumler to take their photograph in the hope that they too could capture images of deceased loved ones. As time went on, demand grew and Mumler was said to have reluctantly made the transition into making spirit photography a full time career. He then moved to New York and it was said that numerous photography experts examined Mumler and could find no evidence of fraud. Skeptics would argue that despite the people investigating Mumler being learned and educated individuals, most people back then simply did not know what they were looking for when it came to identifying fraud, due to the fact these were still the early days of photography and they would have known little about what went on in the dark room. 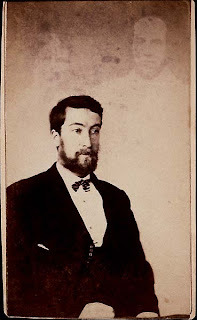 However, William Mumler certainly did allow a great number of skeptics as well as photographic experts (who surely would of been aware of the tricks used to create fake ghostly images) to examine the process from start to finish and to inspect his equipment and people were unable to find evidence of fraud. 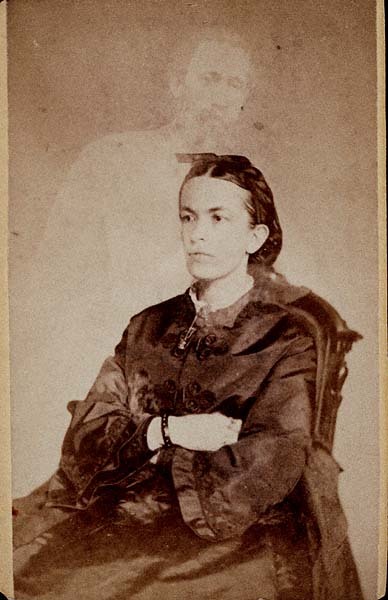 "I have been a photographer for twenty-eight years; I have witnessed Mumler's process, and although I went prepared to scrutinize everything, I could find nothing which savoured of fraud or trickery. The only thing out of the usual routine being the fact that the operator kept his hand on the camera." Despite this and many other supporters, there were ongoing accusations against Mumler including the accusation that Mumler would break into peoples homes in order to obtain photographs of deceased relatives which he could then use to create fake spirit photography. 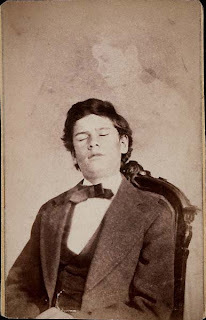 It was also stated that some of the "spirits" appearing in Mumlers photographs were recognised as living persons. These accusations eventually amounted to Mumler being taken to court charged with fraud in 1869. One of Mumler's critics and a person who would testify against him in this court case was a man named Phineas Taylor Barnum. 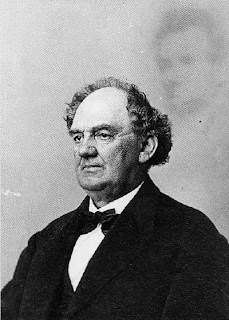 Barnum (pictured left) had gained a reputation in his day as being the "prince of humbugs" as he held a great deal of contempt for what he considered to be fraudulant mediums. 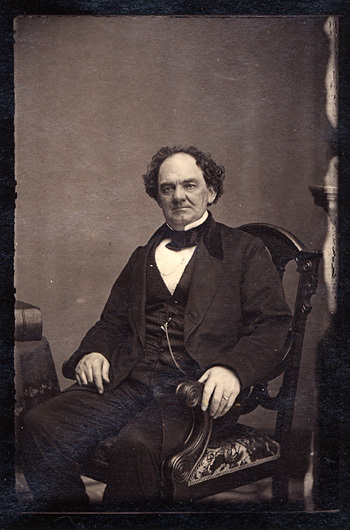 In much the same way as some skeptics of paranormal claims have done today, Barnum offered a financial reward of $500 to any medium who could demonstrate proof of their ability to communicate with the dead. Barnum felt that William Mumler was making profits by taking advantage of people at a time when they were unable to think clearly due to the grief they were experiencing after the loss of a loved one. 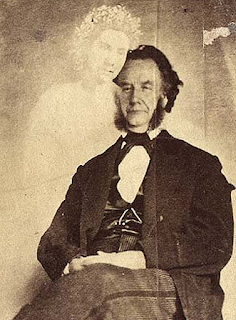 During the court case, Barnum hired a man named Abraham Bogardus, a professional photographer to create a picture which would appear to show Barnum photographed with the ghost of Abraham Lincoln, in order to demonstrate how easy it is to create fake spirit photography. There were those in the court case who came out in support of Mumler, including a journalist by the name of Moses A. Dow who he produced a spirit photograph for. Eventually the court decided that there was not enough evidence to prosecute Mumler of fraud. However, the accusations and court case had already done enough damage to Mumler's reputation to ruin his career. 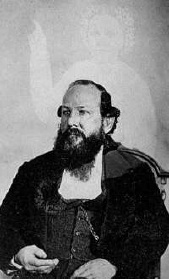 William Mumler died in poverty in 1884. It is said that Mumler destroyed all of his negatives shortly before his death, allowing for his photography to forever remain shrouded in mystery. Above: Perhaps one of the most famous photograph's taken by Mumler, this photograph shows Mary Todd Lincoln sitting with the spirit of her deceased husband Abraham Lincoln standing behind her. 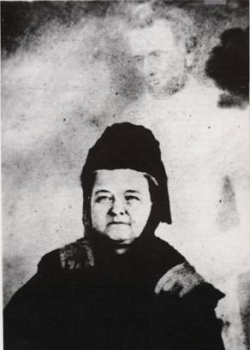 According to reports, William Mumler was not aware of Mary Lincolns identity before the photo was taken, as she had given a false identity by the name "Mrs. Tundall" and she turned up with her face almost completely covered wearing a black hooded robe and asked that she only reveal her face at the exact moment the photo was taken. As the photo developed, it revealed Abraham Lincoln himself to be the spirit "extra". Above: There is a truly remarkable story behind this picture of Moses A. Dow. Read his testimony by clicking here. According to his own testimony, he had managed to make contact through spiritualist mediums with a deceased young girl who he once employed to work for him. She informed him that should he visit a spirit photographer, that she would make an appearance and also gave details as to what position she would take, what she would wear ect. William Mumler took the photograph, as far as I am aware with no prior knowledge of this and Dow even assumed a false identity. Needless to say the image produced a spirit "extra" of the exact description and likeness of the girl who Dow had been in contact with.